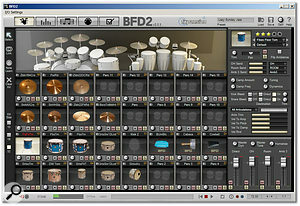 The main Kit page of BFD2 with a 10-piece kit loaded.BFD caused quite a stir when it was first released, and reviews were extremely positive (including Paul White's, which appeared in the February 2005 issue of SOS). With a 9GB core library, plus the additional 22GB in the XFL expansion pack, it certainly qualified as 'big' and it was also definitely 'drums' — FXpansion let users make up their own minds about the 'F', with 'friendly', 'fabulous' or something more expletive being the obvious candidates. 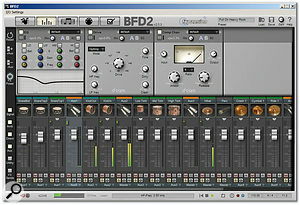 BFD wasn't just a sample library, however; the dedicated front-end provided a playback engine that could be used within all the major DAW hosts and it also included a library of over 1000 grooves — essentially MIDI drum patterns — that could be triggered from within BFD or dragged and dropped into the host sequencer for arranging and editing. Mixing facilities for the various close and room mics were also provided, allowing the user control over the degree of room ambience. In the new release BFD2 boasts a 55GB core library, covering 10 full acoustic kits, multiple mic positions, performance articulations and up to 96 velocity layers. The user interface has been completely redesigned and, as well as comprehensive mixing capabilities, the new version also includes over 5000 drum grooves and a Cubase-like drum-pattern editor. As before, BFD2 works as a VST, RTAS and AU plug-in, and as a stand-alone application. The world of sampled and virtual drumming has not been short of new products since the original BFD was launched (see the 'Drummer Auditions' box for some obvious competitors), so does BFD still make the grade? While the overhaul of the user interface is the first obvious change for BFD2, the sample data is also entirely new. The PDF manual gives the full details but all the BFD2 sounds were recorded in Studio 1 at AIR Studios in London, using a combination of vintage and high-quality modern equipment. The FXpansion web site has an excellent short video on the making of BFD2 (interviewing BFD2's producer Gareth Green), and that's well worth a look. A full multi-mic configuration was used for each element of the kit, including mics both inside and outside the kicks, snare top and bottom, overheads, close room mics (about eight feet away) and ambient mics (23 feet away and therefore catching more of the room sound). The user gains access to all these mic combinations via the BFD2 mixer, which allows extremely detailed control over the drum sound — either very dry from the close mics, very wet if you mix in a healthy dose of the various room mics, or somewhere in between. In all, some 10 full kits were recorded, along with a range of extras (mainly additional hi-hats, cymbals and snares), giving you over 90 kit 'pieces'. 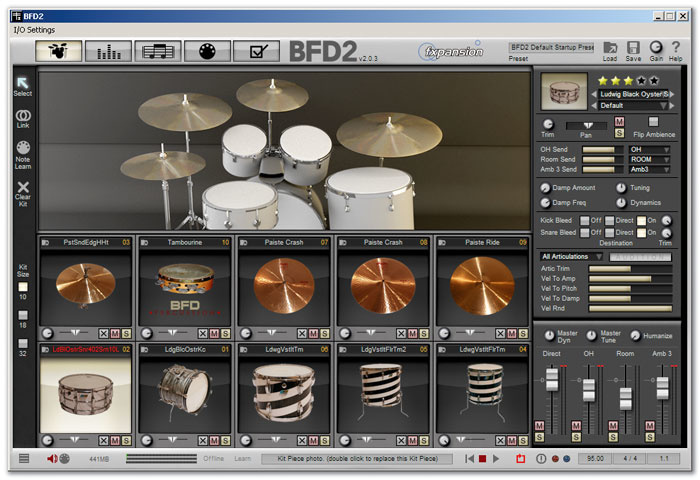 Samples from the original BFD and any of the expansion packs can be used with BFD2, and users can also load their own samples (including multiple velocity layers), should they wish. The comprehensive nature of the sampling strategy used allows BFD2 to offers two key performance elements. Firstly, each kit piece contains an amazing number of velocity layers (up to 96), which means that machine-gun-effect drumming is never an issue. Secondly, for the key kit pieces, multiple articulations are available. For example, the snares all feature normal, off-centre, sidestick, rim and drag-style hits. This creates the potential for very realistic-sounding drum performances to be produced. There's a handful of 'drummer-in-a-box' type products that are obvious competitors to BFD2, including Toontrack's EZ Drummer, Steinberg's Groove Agent, Digidesign's Strike, XLN Audio's Addictive Drums and Submersible's Drumcore. Each offers its own combination of features. For example, Groove Agent provides a wide range of drum-kit samples (acoustic and electronic), as well as an extensive collection of preset patterns and fills and, via MIDI, can be used to build a complete drum track or be used as a playback engine. Submersible's Drumcore also has an interesting take on the idea of the virtual drummer, combining audio loops and MIDI-triggered drum samples, with a series of 'drummer packs' available for extra content. In terms of detailed samples of acoustic drums, the most obvious comparison is probably with Scarbee's Imperial Drums XL. This is supplied with Halion Player as the front end, and the 50GB sample library also features close, overhead and ambient mics that can be mixed to taste. Unlike some products, BFD2 is provided in a suitably environmentally-friendly small box containing the five DVDs of content. While the user can choose different levels of content installation, given the relatively low price of hard drive space it almost seems pointless buying into the idea of BFD2 if you are not going to use its full detail. However, you could imagine installing a somewhat lighter version on a second machine — perhaps a laptop system for use on the move. Fortunately, the challenge-and-response copy protection is suitably flexible to allow up to three installs and FXpansion seem happy to deal with issues arising from system upgrades. The authorisation proceeded without any problems on my Internet-connected test system, but can also be carried out from a separate computer if you like to keep the Internet away from your main music-making machine. Given the quantity of the data, full installation does take some time, so make a cup of something suitable before you get started. The install stage is also a good point to start work on the PDF manual. At 180 pages, this is perhaps best described as 'comprehensive' and, although not the most exciting of reads, it does give a sense of the real depth of functionality that lurks within BFD2. The BFD user interface has also undergone a pretty substantial revamp. While the Kit page provides the default screen upon start-up, the user interface can be switched between this and four other screens — the Mixer, Grooves, Keymapping/Automation and Preferences pages — via the large buttons lined up top-left along the control bar. For a mega kit-and-percussion combination, the 32-piece kit should be just the ticket, although you will need the Percussion Expansion Pack to really make the most of it. The Mixer page provides a very flexible mixing environment.The Kit page is split into three main areas. 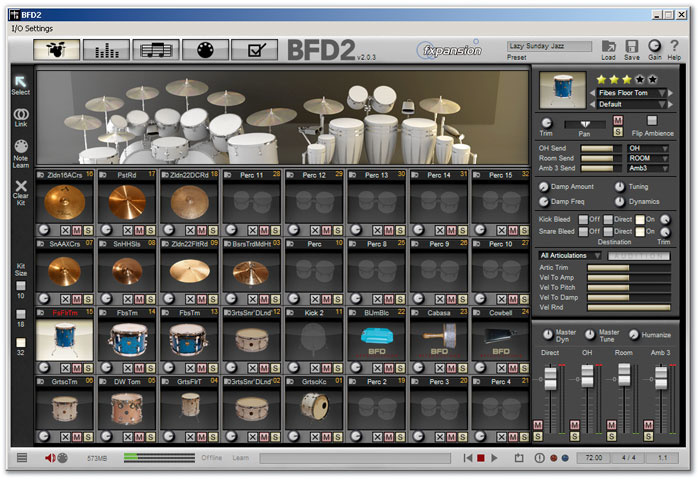 The large image of the drum kit is retained from the earlier version and the sounds associated with each kit piece can be auditioned via the mouse. The bottom half of the display shows the specific drums loaded into each kit-piece slot. To the left of this display are three small buttons that allow you to switch between three different kit sizes; 10, 18 and 32 pieces. The drum-kit display changes to reflect this. For the 32-piece kit it adds a 14-piece percussion ensemble to the 18-piece kit display, but since there are not many percussion instruments included as standard with BFD2 you will need to add the Percussion Expansion Pack (£159) to make full use of this. Controls along the bottom of each kit-piece display allow gain (trim) and pan to be adjusted, as well as providing mute and solo buttons. The 'X' button clears the kit piece and reduces the RAM used (as indicated in the status bar that runs along the base of the main window). A range of further controls is displayed at the top right for the kit piece that's currently selected. These include controls for tuning, dynamics, damping, and a variety of other tweaks that can be made to the sound. The other key element of the Kit page is the mini-mixer display located at the bottom right. For basic blending of the various key microphone groups — direct, overheads, room and ambience — this might be all you need. Master dynamics, tuning and humanise controls are also provided here. While individual kit pieces can be loaded into a specific slot, loading a full kit (as well as various other elements of a BFD2 setup) can be performed via the Load button in the control bar. A BFD2 'preset' includes all the BFD2 settings, while a 'kit' loads all the kit pieces of any one of the 10 sampled kits. Mixer, Palette (a set of related Groove patterns), key maps and automation presets can also be loaded separately via this menu. While the relationship between these various elements take a little getting used to, they do offer tremendous flexibility. If you need greater control over mixing than is offered by the mini-mixer on the Kit page, the Mixer page is the place to go. At first sight, this appears a little on the busy side but FXpansion have crammed a lot of functionality into a compact space. The display is split into two halves. The lower section shows the usual virtual mixer channels. The exact format of the display can be altered via the six buttons located in a vertical strip to the far left. For example, toggling on the FX Send button in this strip switches between larger faders plus a drum graphic on the one hand, and shorter faders with insert FX and FX send slots visible on the other. The upper portion of the display shows any effects that are inserted into the currently selected mixer channel. Up to four insert slots are available and BFD2 includes a nice range of dedicated treatments covering EQ, compression, delay, filtering, modulation and drive, amongst a few others. The compressor effects, in particular, sounded good to me, although it is worth noting that these are proprietary effects — they cannot be used outside BFD2, nor can VST plug-ins be used within the BFD2 mixer. The mixer supports auxiliary channels, so you could, for example, submix all the snare mics to an aux channel and apply effects to just the aux channel, rather than having to insert compressors and EQs on all the individual snare mic channels. As BFD2 offers up to eight stereo and 16 mono outputs, it is also possible to pass individual drum mic outputs to your host sequencer, if you would rather do your mixing and effects processing in that environment. However, the bottom line here is that BFD2 now provides an extremely flexible mixing environment and offers all the sorts of possibilities that you might get with a multi-mic setup on a real drum kit. BFD2's ability to work with Grooves has also been considerably expanded. Up to 128 Grooves can now be loaded at any one time. These appear mapped to keyboard notes on the right-hand side of the window (within the Groove Palette). Over 5000 Grooves are provided, and these can be previewed and loaded via the Load menu, either individually or in groups. The styles cover blues, country, rock, folk, funk, hip hop, house, drum & bass and African, and also a range of tempos. The highlights on the Groove page are the Editor and the Drum Track above it. 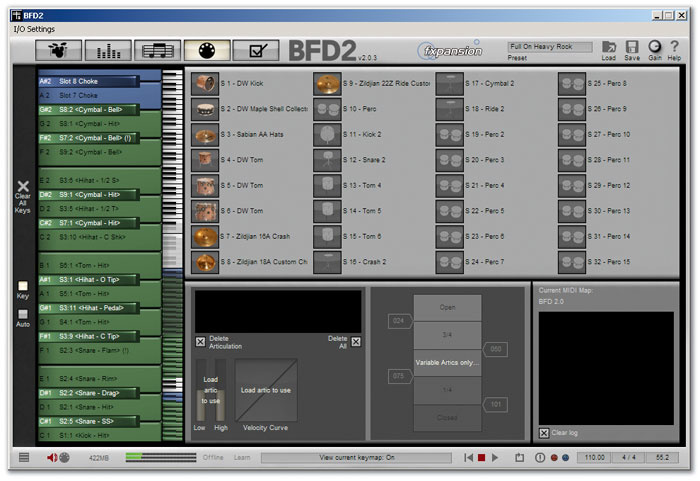 BFD2 provides extensive keymapping functions — great for using it with an electronic kit.The new Groove Editor occupies the bulk of the window. It's not dissimilar to the MIDI drum editors found in most major sequencers but includes dedicated lanes for the different articulations offered by BFD2, and can be collapsed and expanded as required. All the usual editing functions are provided, including a velocity lane that can be toggled on or off. By providing direct access to the different articulations, the Editor does encourage you to add embellishments, and it's amazing what the addition of the occasional dragged or half-edge snare hit can do to give a pattern a little more life. The various Groove FX functions are located along the base of the Editor window and include the very usable Human Time and Human Velocity controls, which add something of a random element to the performance. Further flexibility is provided by the functions that allow you to audition a kit element from one Groove (for example, the kick drum) within a second Groove while it is playing back. If you like what you hear, the kit element can be dragged and dropped from the Groove Palette into the Editor where it can automatically replace, or be merged with, the current performance. This edited Groove can then be saved as a new Groove to an empty slot within the Groove Palette. You can, of course, create your own Grooves from scratch, either via the Editor or live via MIDI. 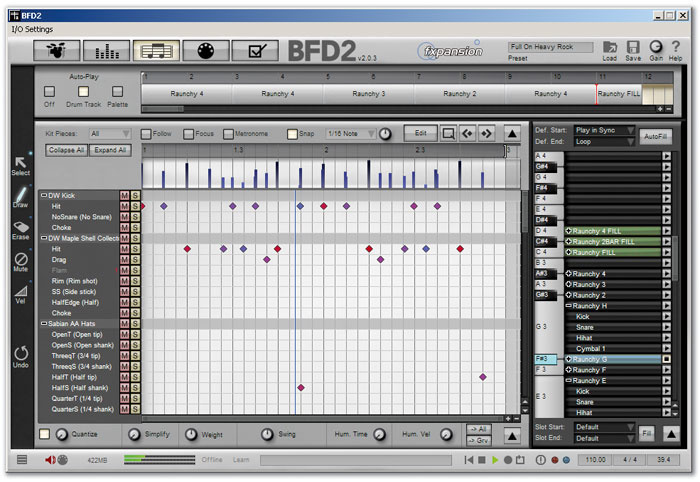 While BFD2 now uses a proprietary file format for Grooves, it can still open MIDI files, and Grooves can still be dragged and dropped onto a MIDI track in the host sequencer for arranging. However, the Drum Track, located above the Editor, provides an alternative approach, as Grooves can also be dragged and dropped here for arranging. They will then play back in sync with any host sequencer. While this Drum Track is perhaps mainly intended for those using BFD2 as a stand-alone application, or for those who simply want to quickly hear how two or three Grooves work together, it does work very well. As with the Mixer window, there is an awful lot going on within the Grooves window and new users might find it takes a little time to explore. However, the flexibility and functionality are clear — this is a powerful editing/sequencing environment that matches the sophistication of the drum sampling with which it is used. The MIDI Note Learn wizard within the Kit page provides an easy way to associate MIDI controllers with particular drum sounds but, for more comprehensive control, the Keymapping section of the Keymapping/Automation page is available. This would be particularly useful for those using an electronic kit to trigger BFD2 sounds. 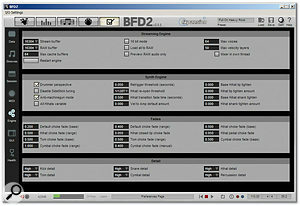 The Automation section of this page, as its name suggests, allows BFD2's controls to be automated via your host sequencer. Again, this is well featured. There are plenty of ways to reduce the load on the host computer, via the Engine settings on the Preferences page.Given the comprehensive nature of the samples, one might expect BFD2 to be a little hungry in terms of computer resources. Fortunately, alongside all sorts of other settings, the Engine section of the Preferences page allows the user to lighten this load. For example, under the Streaming Engine settings, a 16-bit mode can be selected and the number of velocity layers can be restricted. Having made changes of this kind, you can apply them with the Restart Engine button. This makes it easy to move between a 'lite' version of BFD2 while tracking and a 'full-on' version when performing a final mixdown. The other key feature worth discussing is the audio export, which allows a BFD2 performance to be rendered to a series of audio files. This process is initiated via the Export options in the Utility section of the Mixer page, and as any of the Mixer's channels can be armed for recording (via the 'R' button on each channel strip), it allows either a simple stereo mixdown or a full multi-channel drum recording to be rendered. The latter would be particularly useful either for transporting the BFD2 drum performance to a system where BFD2 itself was not available (when moving between studios, for example) or for archiving a recording project in an audio-only format. Of course, all this functionality is just so much froth if the drums sound like a bag of spanners in a tumble dryer. Fortunately, they do not; BFD2 simply contains some of the best multisampled acoustic drum sounds currently available. I did the majority of my testing of BFD2 within Cubase 4 and the experience was a wholly pleasurable one — the plug-in version of BFD2 behaved extremely well throughout my testing. While it certainly does place a load on the host system, the flexibility offered by the Preferences page ensured that this never became a real issue. The ability to drag and drop grooves into the host sequencer worked a treat and I found myself auditioning grooves, or small numbers of grooves together, within BFD2, before dragging them to a track in Cubase for arranging. This made it very easy to build complete drum tracks. 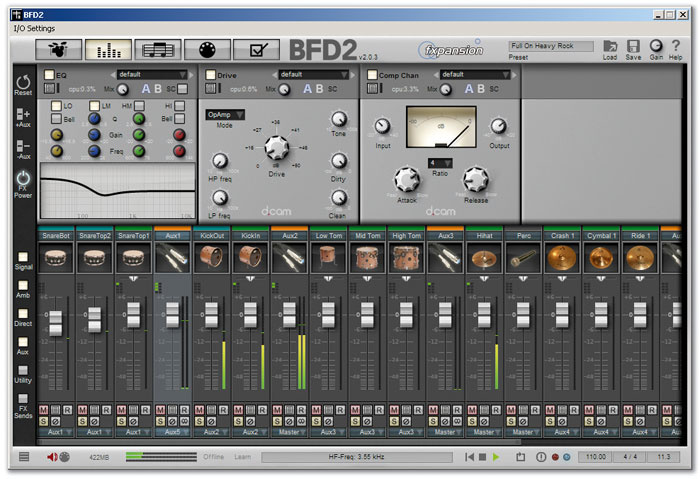 Alternatively, the BFD2 Groove Editor is familiar enough, compared with the Cubase MIDI editing environment, to make composing or tweaking Grooves inside BFD2 a straightforward task right from the off. BFD2 is, however, a deep application and to get the best out of it does require some time — new users take note. 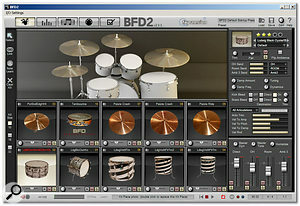 Given the combination of price and features, BFD2 is perhaps not for producers who prefer their drums pre-packaged as loops. However, for those serious about their acoustic drum sounds, BFD2 is an equally serious application. It might be a little daunting at first but this just reflects the sophisticated control on offer. The level of attention paid to the sampling borders on the obsessive, and for many users might be a little over the top, but the end result is a set of acoustic drum sounds that could grace almost any recording, with quality that would be well beyond what most home and project studio owners could dream of achieving in their own studios. These Big F***ing Drums are definitely B***dy F***ing Good! Mac: G5 or Intel CPU, 1GB RAM, 60GB hard disk space, Mac OS 10.4 or higher, DVD drive, internet connection (for authorisation). PC: Pentium IV CPU, 1GB RAM, 60GB hard disk space, Windows XP or Vista 32, DVD drive, internet connection (for authorisation). Wonderfully detailed samples that sound fabulous. Excellent control over the drum mix. Great collection of grooves and good editing options. A bit daunting at first. Can be a little resource hungry but offers good customisation options to cope with this. 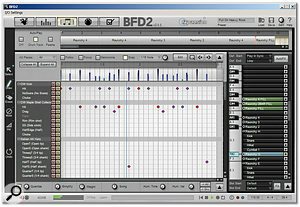 If you are serious about your acoustic drum sounds, BFD2 is a serious tool for getting the job done. Well worth the asking price and well worth auditioning. £242; upgrade from BFD, £124. Prices include VAT.